I am going to write something about another important character from Mahabharata, Drona. Drona was the Guru (Teacher) of Kauravas and Pandavas. He was a well known warrior of his times and being his disciple was a matter of pride. Though he has his flaws, for example he was partial towards Arjuna as when he met an equally gifted archer in form of Ekalavya, he did not hesitate and asked for his thumb as Gurudakshina, to ensure that Arjuna remains the best archer in their times. Nevertheless, prowess of Drona as a warrior or fighter cannot be quetioned, such was his effect that Krishna resorted to some less than honourable tactic to render him useless on fifteenth day of the Mahabharata war. This also led to the only blemish on Yudhisthir, who lied(partially) only once in his lifetime. Drona was particularly fond of his son Ashwatthama and Krishna used his name as bait for Drona. Here is the full story of Drona, The great warrior. In the epic Mahabharata, Drona or Dronacharya is the royal guru (teacher) to the Kauravas and the Pandavas. He was a master of advanced military arts, including the devastras. Arjuna was his favorite student. Drona’s love for Arjuna was only second to his love for his son Ashwatthama. Drona was born a brahmin, son of Bharadwaja, in modern day Dehradun (a modification of dehra-dron, a clay pot), which implies that he was not gestated in a womb, but outside the human body in a Droon (vessel). The story of Drona’s birth is recounted dramatically in Mahabharat, Book I: Adi Parva, Sambhava Parva, Section CXXXI. Sage Bharadwaja went with his companions to the Ganges to perform his ablutions. There he beheld a beautiful apsara named Ghritachi who had come to bathe. The sage was overcome by desire, causing him to ejaculate and captured the fluid in a vessel called a drona, and Drona himself sprang from the fluid thus preserved. Drona would later boast that he had sprung from Bharadwaja without ever having been in a womb. Drona spent his youth in poverty, but studied religion and military arts together with the then prince of Panchala, Drupada. Drupada and Drona became close friends and Drupada, in his childish playfullness, promised to give Drona half his kingdom on ascending the throne of Panchala. Drona married Kripi, the sister of Kripa, the royal teacher of the princes of Hastinapura. Kripi and Drona had Ashwathama as son. Learning that Parshurama was giving away his fruits of penance to brahmanas, Drona approached him. Unfortunately by the time Drona arrived, Parasurama had given away all his belongings to other brahmanas. 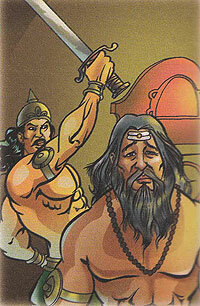 Taking pity upon the plight of Drona, Parasurama decided to impart his knowledge of combat to Drona. For the sake of his wife and son, Drona desired freedom from poverty. 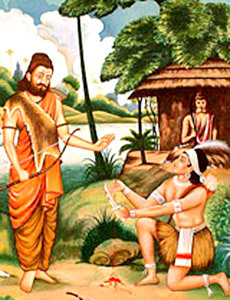 Remembering the promise given by Drupada, he decided to approach him to ask for help. However, drunk with power, King Drupada refused to even recognise Drona and humiliated him by calling him an inferior person. In the Mahabharata, Drupada gives Drona a long and haughty explanation of why he is rejecting him. Friendship, says Drupada, is possible only between persons of equal station in life. As a child, he says, it was possible for him to be friends with Drona, because at that time they were equals. But now Drupada had become a king, while Drona remained a luckless indigent. Under these circumstances, friendship was impossible. However, he said he would satisfy Drona if he begged for alms befitting a Brahmin rather than claiming his right as a friend. Drupada advised Drona to think no more of the matter, and to be on his way. Drona went away silently, but in his heart he vowed revenge. Dronacharya’s legend as a great teacher and warrior exceeds Hindu mythology by strongly influencing Indian social traditions. Drona inspires great debates about morality and dharma in the Mahabharata epic. Drona went to Hastinapura, hoping to open a school of military arts for young princes with the help of the king Dhritarashtra. One day, he saw a number of young boys, the Kauravas and Pandavas gathered around a well. He asked them what the matter was, and Yudhisthira, the eldest, replied that their ball had fallen into the well and they did not know how to retrieve it. Drona laughed, and mildly rebuked the princes for being helpless over such a plain problem. Yudhisthira replied that if he, the brahmin, could retrieve their ball, the king of Hastinapura would provide all the basic necessities to him for life. Drona first threw in a ring of his, collected some grass blades, and uttered mystical Vedic chants. He then threw the blades into the well one after another, like spears. The first blade stuck to the ball, and the second stuck to the first, and so on, forming a chain. Drona gently pulled the ball out with this rope of grass. In a feat that was even more amazing to the boys, Drona then chanted Vedic mantras again and fired a grass blade into the well. It struck within the center of his floating ring and rose out of the well in a matter of moments, retrieving Drona’s ring. Excited, the boys took Drona to the city and reported this incident to Bhishma, their grandfather. Bhishma instantly realized that this was Drona, and his prowess exemplified, asked him to become the Guru of the Kuru princes, training them in advanced military arts. Drona then established a school near the city, where princes from numerous kingdoms around the country came to study under him. Of all the Kaurava and Pandava brothers training under Drona, Arjuna emerges as the most dedicated, hard-working and most naturally talented of them all, exceeding Drona’s son Ashwathama as well. Arjuna assiduously serves his teacher, who is greatly impressed by his devoted pupil. Arjuna surpasses Drona’s expectations in numerous challenges. When Drona tests the princes’ alertness and ability by creating an illusion of a crocodile attacking him and dragging him away, most of the princes are left dumbfounded. But Arjuna swiftly fires arrows that slay the illusionary animal, and Drona congratulates Arjuna for passing this test. As a reward, Drona gifts Arjuna the super-powerful divine weapon of Brahma known as BRAHMASIRIVAS.However, he tells Arjuna not to use this irresistible weapon against any ordinary warrior. This weapon had a sharp edge surrounded below by 3 heads of Lord Brahma. In another challenge, Drona gives each prince a pot to fill with water and swiftly return. Whoever returns fastest would receive instruction in some extra special knowledge. He gives his son Ashwathama a wide-necked pot unlike the other’s narrow-necked ones, hoping he will be the first to return. But Arjuna uses his knowledge of a mystical water weapon to fill his pot swiftly and returns first. In a great challenge, Drona sets up a wooden bird upon a tree, and from across the adjacent river, asks the princes to shoot it down by striking its eye. When prince Yudhisthira tries first, Drona asks him what he saw. Yudhisthira replies he saw Drona, his brothers, the river, the forest, the tree and the bird. Drona replies that Yudhisthira would fail and asks another prince to step forward. The others give the same reply, and Drona is disappointed with all. But when Arjuna steps forth, he tells Drona that he sees only the eye of the bird and nothing else. When Drona excitedly asks him to continue, Arjuna replies that he saw only the bird’s eye. Drona asks him to shoot, and Arjuna strikes the bird down in the eye. Drona had advised the chefs of the palace not to serve food to Arjuna in the dark. However, one night, it so happened that Arjuna was served food in the dark. He subtely observed that he was able to eat food in dark. By practice, hands would reach one’s mouth even in darkness. This striked Arjuna to practice archery in darkness. He begins training by night to use his weapons in absolute darkness, and steadily achieves a great level of skill. Drona is greatly impressed by Arjuna’s concentration, determination and drive, and promises him that he will become the most powerful warrior on earth. Drona gives Arjuna special knowledge of the devastras that no other prince possesses. Ekalavya is a young prince of the Nishadha tribes, who comes to Drona for instruction. Drona rejects him on account of him not belonging to the Kshatriya varna (caste). Ekalavya is undeterred, and entering a forest, begins study and practice by himself, having fashioned a clay image of Drona and worshipping him. Solely by his determination, Ekalavya becomes a warrior of exceptional prowess, at par with the young Arjuna. One day, a dog barks while he is focused upon practice, and without looking, the prince fires arrows that seal up the dog’s mouth while not causing any harm. The Pandava princes see this dog running, and wonder who could have done such a feat. They see Ekalavya, who announces himself as a pupil of Drona. Arjuna is worried that his position as the best warrior in the world might by usurped. Drona sees his worry, and visits Ekalavya with the princes. Ekalavya promptly worships Drona. Drona is angered by Ekalavya’s unscrupulous behavior, claiming to be Drona’s student despite his rejection. He is also worried that if Ekalavya maintained this level of skill, he would one day become warrior par-excellence than himself. The more important and personal reason seems to have been his partiality towards Arjuna. Drona asks Ekalavya for a dakshina, or a deed of thanks a student must give to his teacher upon the completion of his training. Drona asks for Ekalavya’s right thumb, which Ekalavya unhesitatingly cuts off and hands to Drona, despite knowing that this would irreparably hamper his archery skills. Drona similarly rejects Karna, as he does not belong to the kshatriya caste. Humiliated, Karna vows to exact revenge. He obtains the knowledge of weapons and military arts from Parasurama, by appearing as a brahmin, and challenges Arjuna in the martial exhibition. Thus, Drona inadvertently laid the foundation for the Karna’s great rivalry with Arjuna. On completing their training, Drona asked the Kauravas to bring Drupada bound in chains. Duryodhana appoints Vikarna, the best warrior among the Kauravas, as the army commander. Then he, Dushasana, Sudarshana, Yuyutsu, Vikarna and the remaining Kauravas attack Panchala with the Hastinapur army. They fail to defeat the Panchala army, whereupon Drona sent Arjuna and his brothers for the task. The 5 Pandavas attacked Panchala without an army. Arjuna captures Drupada as ordered. Drona takes half of Drupada’s kingdom, thus becoming his equal. He forgave Drupada for his misdeeds, however Drupada burnt in the desire for revenge and performed a yagna to have a son who would slay Drona and a daughter who would marry Arjuna. His wish was fulfilled and thus was born Dhristadyumna, the slayer of Drona, and Draupadi, the consort of the Pandavas. Drona strongly condemns the wicked prince Duryodhana and his brothers for their abusive treatment of the Pandavas, and for usurping their kingdom by sending them into exile. But being a servant of Hastinapura, Drona is bound by duty to fight for the Kauravas, and thus against his favorite Pandavas. Drona is one of the most powerful and destructive warriors in the Kurukshetra War. He is an invincible warrior, whom no person on earth can defeat, and he single-handedly slays hundreds of thousands of Pandava soldiers with his powerful armory of weapons and incredible skill. After the fall of Bhishma, he becomes the Chief Commander of the Kuru Army. Drona had been the preceptor of most kings involved in the war, on both sides. On the 13th day of battle, the Kauravas challenge the Pandavas to break a wheel shaped battle formation known as the Chakravyuha. Drona as commander forms this strategy as he knows that only Arjuna and Krishna know how to penetrate it. He asks the king of the Samshaptaka army to distract Arjuna and Krishna into another part of the battlefield, allowing the main Kuru army to surge through the Pandava ranks. However, Arjuna’s young son Abhimanyu is able to penetrate the formation. However, he is trapped when Jayadratha, the king of Sindhu holds the Pandava warriors following him at bay. Abhimanyu does not know how to get out of the Chakra Vyuha, but goes upon an all-out attack on the Kuru army, killing tens of thousands of warriors single-handedly. He even holds Karna and Drona himself at bay. Amazed at his prowess and courage, he is likened by the Kurus as his father’s equal in greatness. However, his army facing decimation, Drona asks Karna, Dushasana and others to simultaneously attack Abhimanyu, to strike down his horses, his charioteer and to disable his chariot from different angles. Left without support, Abhimanyu begins fighting from the ground, whereupon all the Kuru warriors simultaneously attack him. Exhausted after his long, prodigious feats, Abhimanyu is weakened and grabs one of the wheels of his chariot and blocking all the attacks, but is eventually killed with the stabbing of seven swords, simultaneously. This was a low moment in the Mahabharata, which paved the way for many more incidents where Dharma was not followed. All this was an extreme violation of the rules of war, whereby a lone warrior may not be attacked by more than one, and not at all if he is disabled or without chariot. This devious murder of his son enrages Arjuna, who swears to kill Jayadratha, whom he sees as responsible for his son’s death. If he failed to do so the next day, he would step into fire and commit suicide. Drona lines up the entire Kuru army, with millions of its soldiers in front of Arjuna to thwart his mission. But Arjuna exhibits his full prowess, and by the end of the day has killed more than a million warriors single-handedly. With the help of Krishna, he slays Jayadratha in the nick of time. But on the whole, Arjuna devastates the entire Kuru army dramatically in just one day of fighting. In the war of Mahabharata, Yudhisthira is targeted by Drona to be captured. For this plan to be successful, Duryodhana invites King Bhagadatta, son of the great asura Narakasura to fight against the Pandavas. Bhagadatta was the king of Prajokiyatsa, modern day Burma. As Krishna had killed Narakasur, Bhagadatta agreed to join the Kauravas. But, in spite of Bhagadatta’s support, Drona fails to capture Yudhistra alive. The Kuru commander and preceptor is however killing hundreds of thousands of Pandava warriors and thus advancing Duryodhana’s cause. On the 15th day of the Mahabharat war, Drona, instigated by King Duryodhana’s remarks of being a traitor, uses the Brahmadanda. This spiritual divine weapon contained the power of the seven greatest sages of Hinduism. Drona had neither imparted the knowledge of this divine weapon to either Ashwattama or Arjuna. Thus, he proves unconquerable on the 15th day of Mahabharat war. Krishna asks Yudhisthira to proclaim that Drona’s son Ashwathama has died, so that the invincible and destructive Kuru commander would give up his arms and thus could be killed. Bhima proceeds to kill an elephant named Ashwathama, and loudly proclaims that Ashwathama is dead. Drona knows that only Yudhisthira, with his firm adherence to the truth, could tell him for sure if his son had died. When Drona approaches Yudhisthira to seek to confirm this, Yudhisthira tells him that Ashwathama is dead…, then, ..the elephant, but this last part is drowned out by the sound of trumpets and conchshells being sounded as if in triumph, on Krishna’s instruction. Yudhisthira cannot make himself tell a lie, despite the fact that if Drona continued to fight, the Pandavas and the cause of dharma itself would lose. When he speaks his half-lie, Yudhisthira’s feet and chariot descend to the ground momentarily. Drona is disheartened, and lays down his weapons. He is then killed by Dhristadyumna. This was the only incident in Mahabharat, when Yudhisthira spoke a lie. This caused his chariot to touch the ground, otherwise it always remain above the ground. It is said that Drona’s soul, by meditation had already left his body before Dhristadyumna could strike. His death greatly saddens Arjuna, who had hoped to capture him alive. Thus the great teacher from Mahabharata, has met his end.